Description of "Love has yet..."
India emerged out of a small village, a young poet who has broken concept that love and the literature varies. Written in very precise terms, these verses of the poet reveal the tenderness of the heart that is so takes the right chord with the readers. Those who begin to read the poet's work could not wait without reading the entire book and this poetry reflects familiarity. 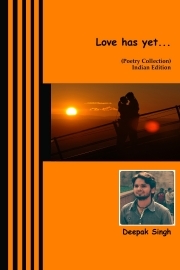 This Poetry collection consist of 10 best poems of Poet. Deepak Singh (Pen Name – Thakur Deepak Singh Kavi) (March 1, 1993) is a Hindi poet who has also penned short stories, literary biographies and travelogues, and known as Yuva Kavi- the Youths’ Poet. Thakur Deepak Singh Kavi was Born into a Rajput family in a small Village Kabutara in Azamgarh District of Uttar Pradesh, India. His father Late Amarjeet Singh and Mother Meera Singh belongs to a simple family, which is totally dependent to Agriculture. After the death of his father due to blood cancer in 1999, his uncle Arun Singh took the responsibility of his further education. He has a younger brother named Abhishek Singh. He completed his High School and Intermediate from Children Senior Secondary School, Azamgarh, Uttar Pradesh. After his basic education, due to some family problems he decided to do engineering in computer science from Apollo Institute of Technology, Kanpur affiliated to Uttar Pradesh Technical Education, Lucknow. His Literary work started from a very small age of 12 years. He has gone through many family and social problems after the death of his father. The pain expressed clearly in his creations. He was appraised by his teachers and class fellows which influenced him to continue his creative writings. He always give his literary frame work credits to his school time Hindi Teachers Dr. S.K.Shukla and Dr. ShriRam Singh. He participated in 'All India Youth Poet Summit' in 2007. After many time neglected, he got his first publication in 'Awaaz' Magazine published from his hometown Azamgarh. Untill now he has got published more than 40 poems and articles in Indian Leading online magazine 'Swargvibha' administrated by leading Indian Poetess Dr Tara Singh, Pratilipi Hindi, Literature in India Online Magazine and many more Literary platforms. Reviews of "Love has yet..."